I burrowed my hands through layers of straw and wood shavings in what was the most exciting game of lucky dip I’d ever played. The recipient of my hoped-for catch bubbled and gurgled, consistently and indifferently as it has for millennia, but right now I could almost imagine that the sound of it’s flow was bursting with expectation, like a child at Christmas, eager to receive that which had been lost from it. Sure enough, my finger caught hold of what felt like a leathery shoelace, and without hesitation, I withdrew its proprietor with the same triumph (in fact, probably more triumph) of Arthur withdrawing the sword from the stone. The first two water voles were extracted from their temporary lab-cage digs more or less immediately after each other. The third, like a student unwilling to graduate and face reality, made more of an effort to bury himself away from my liberating hand, but sure enough he too soon found himself sitting on the banks of the River Meon, gazing at his new chalk river home with the updated status of official wild animal. 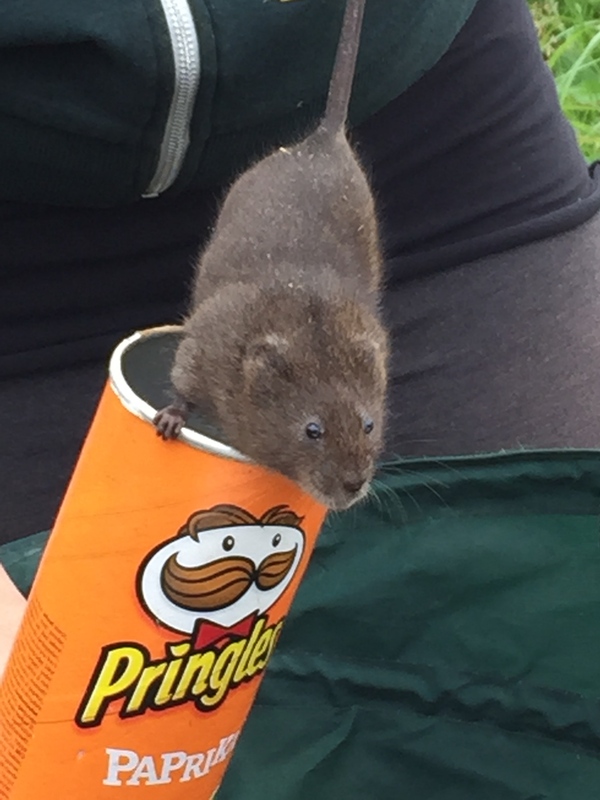 Water vole prior to release, using the tried and tested, perfect method of pringle tube transportation. This was my first water vole release during the three days I spent assisting a reintroduction of these animals last month. Despite its more famous neighbours, the Itchen and Test, supporting nationally important and locally important populations of water voles respectively, the Meon had been sterilised of the rodent some years ago by mink. But following eradication programmes, three years ago it was considered safe to start bringing Ratty back to its banks. This is crucial on so many ecological levels; water voles are the base of the food web for many predators of riparian ecosystems, which is why so many are released in one go (320 in this particular week), as only about 1 in 10 will survive the year (This does not go down well when they are told beforehand, lined up military style in their nice clean uniforms, that many of them will die. ‘But it’s for the survival of your species!’ Announces the general triumphantly, and they all give high-pitched cheers anyway.) And while there is currently little in the literature to affirm this, it seems likely that water voles are important ecosystem engineers through their burrowing and foraging activity. They’re the rabbits of our waterways, and we need them back. Despite this, reintroductions have always been met with mixed opinions even within the conservation community. They tend to go either extremely well (ie. Red kite) or extremely badly (ie. Golden lion tamarin, at least on the first go). Captive bred or translocation? Soft or hard release? Too little or too much money? Should or shouldn’t we? Such questions dog programmes whether it is for field crickets or amur leopards, and probably confuse anyone reading them who doesn’t know exactly what they mean. So I’m going to focus on two prospective and ambitious programmes here in the UK. While we are yet to see the final outcome, one seems to be doing it very right and the other… well, perhaps not so much. I’ve been very lucky in that my dissertation subject is in an area of zoology I’m very interested in, largely as a result of making it clear to my biology of mammals lecturer that I was very geeky about mammalogy and their conservation in the field. Part of this involved gaining a reputation of ID’ing obscure foreign mammals in lectures to an extent that even Hermione Granger would find irritating. Sure enough, I was granted a project working alongside the Vincent Wildlife Trust’s pine marten reinforcement in Mid-Wales, where I would be collecting data on the ecological preferences of their small mammal prey in this area compared with those currently living alongside martens in Scotland. Wild pine marten photographed in the front garden of the cottage I was staying in on the West coast of Scotland this Summer. Will this be a common sight in Wales soon? Subsequently, I braved the cold rain, wind and brummie-filled campsites* typical of a Welsh July to gather this data, trapping mice, voles and shrews for a fortnight. 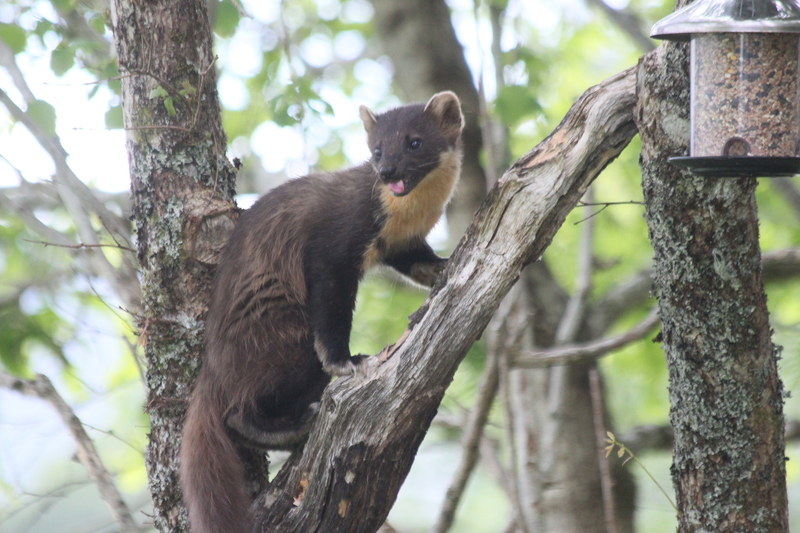 This is just one bit of a huge amount of pre-release research, aiding what the VWT has already achieved from feasibility assessments, prey biomass surveys, landowner approval and community forums – all essential good practice before you release an animal like a pine marten. Pine martens are believed to have been Britain’s second most common carnivore a couple of thousand years ago, a quite contrary situation to their current status as Britain’s second rarest carnivore. Stuck in the upland regions of Scotland, you’ll have the trigger-happy gamekeepers of 18th/19th century shooting estates to thank for that. Since it’s grant of full protection in the late 20th century however, marten numbers are booming in Scotland. But they don’t seem to be that great at dispersal, seemingly preferring to move into a crofter’s loft than go south of the border (even though attempts at the latter are becoming apparent.) This includes mid-Wales, where a population reinforcement is due to take place. Populations are thought to be too low and scattered to set off anything long-term, and that is why translocations from high density areas in Scotland are taking place. The martens have recently come into vogue thanks to the Sheehy study in Ireland, which suggests a positive correlation between grey squirrels scarpering and red squirrels getting on with life when pine martens are in the neighbourhood. But no matter how much ecological sense it may make to bring them back, or how much conservationists like myself want to see them there, it’s crucial to get your homework done first, and have the people that will be living alongside the animals on-board too. VWT, as mentioned earlier, has done these things in exemplar fashion, and subsequently, within a year of getting the project going, the first martens are due to be released in a matter of weeks. Few have heard of it, as most of the press focus has been directed at local outlets, and only after licences had been gained, landowners said yes and the project was on the green light. Compare this to another proposed reintroduction, which has received a huge amount of press attention this year. The clue as to why I think this is likely to go the way of Icarus is in that prior sentence. 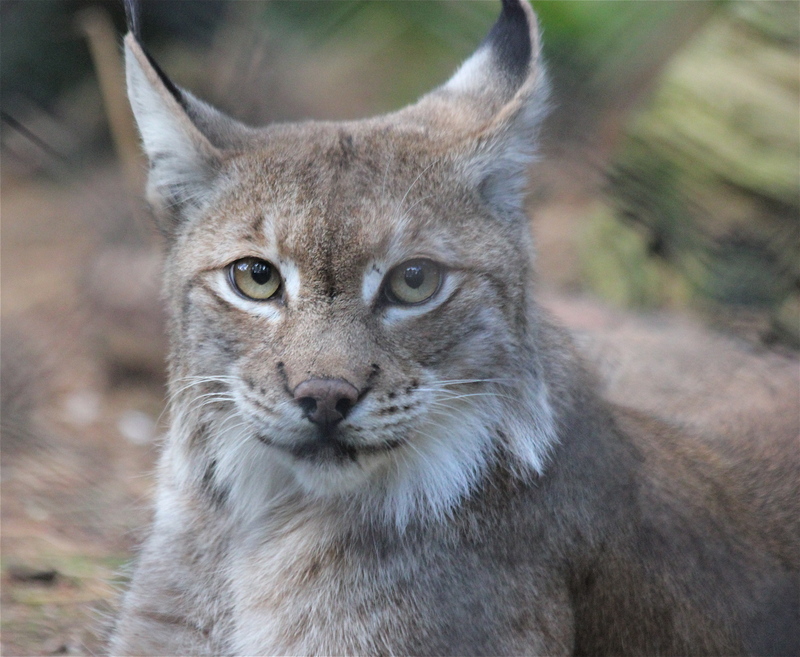 Newly set-up charity the UK Lynx Trust proposed a few months back that it was going to bring lynx back to Scotland, the Lake District and Thetford Forest. The trouble was, they hadn’t even sorted any licences yet, and had barely got talking to any of the potential communities involved. Instead, by going straight to the mainstream British media with an all singing all dancing ‘this is what’s going to happen’, those living in their proposed reintroduction sites woke up to the news with a reaction that would have been akin to “What?! They never told us about this!”, probably as they accidentally spilled/spat their morning coffee in shock onto their cat and created their own feline catastrophe in their living room. Northern Lynx, photographed in Britain – at the New Forest Wildlife Park. Don’t get me wrong, I’d absolutely love to see lynx back, and I see it as a priority species for reintroduction. The point is, by going ‘story first, reality later’, the trust’s Paul O’Donoghue and his team have come across as more distant and untrustworthy to the people on the ground that they’ll need to work with. It doesn’t help that O’Donoghue has already burnt many bridges with others in the conservation world, and even the most ambitious conservationists I know are seriously doubtful of UKLT’s methods, dodgy data and over-simplification of many of the issues surrounding large carnivore reintroduction. So all in all, I highly doubt O’Donoghue and his team will be getting the licences anytime soon. If there is any good to come out of this, it will be that it has brought the topic of lynx reintroduction into the limelight, and hopefully in the not-too-distant future a properly thought-out programme between conservationists, academics, farmers, landowners, foresters and the like can help to shape this into reality. My time releasing water voles has shown me how, done right, reintroductions can be huge forces for good in rebalancing ecosystems, provide a neat ‘end-game’, and give those working in them one of the greatest feelings of satisfaction anyone in conservation could ask for. So long as we ensure we allow our heads to drive our hearts, and think with the long term good of nature (and I’m including humans in that) in mind, it will be intriguing to see what lies ahead as I begin my career as a wildlife conservationist. All views put forward in this blog are my own, and not necessarily of those I have worked for in the Derek Gow Consultancy or Vincent Wildlife Trust. *I’ve not got anything against Brummies in particular, but this family was very loud.